Greek control of Egypt began in 332 BC, when Alexander the Great of Macedon overthrew the Persian rulers and established Alexandria as the capital of Greek governed Egypt. Alexander showed great respect for the local customs and cultures. He even visited the Oracle of Amun (in present-day Siwa), where he was (conveniently) proclaimed the heir of Amun-Re. While introducing some aspects of Greek (or Hellenistic) culture, Alexander allowed the native Egyptians to continue many of their own administrative functions and for many years, military and civilian administrations were kept separate. In 331 BC, Alexander departed Egypt for the East, leaving Cleomenes in charge of the kingdom in his absence. Upon Alexander’s death in Babylon in 323, his entire empire was rocked by a succession crisis, which pitted many of Alexander’s former colleagues against one another. Eventually one of his top generals and childhood friends, Ptolemy seized the territory of Egypt, eventually proclaiming himself as "Pharaoh" and ushering in 300 years of Ptolemaic rule. Ptolemaic Egypt was a culturally and intellectually lively place. Under the guidance of his teacher, Demetrius Phalereus (who was in turn a former pupil of Aristotle), Ptolemy built the Museum and Library of Alexandria and invited scholars from all around the world to come and join the intellectual community of the city. Many great thinkers were nurtured during this time, among them: Euclid, the famous mathematician, Eratosthenes, the mathematician and geographer who used measurements of the angle of the sun at two different places in Egypt to estimate the circumference of the Earth to be 39,690 kilometers (an error of less than 1%), and Herophilos, founder of the medical school of Alexandria, whom performed the first human dissections and was an early pioneer of the scientific method. Ptolemy I died in 283 BC and his son Ptolemy II ascended the throne. Ptolemy II commissioned a number of important construction and engineering projects. 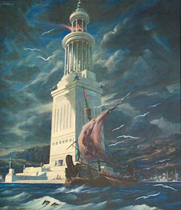 He completed the construction of the Great Lighthouse of Alexandria, one of the Seven Wonders of the Ancient World, which was started during his father's reign. Ptolemy II also sponsored the re-opening of the canal between the Red Sea and the Nile River, that had existed during the Persian era but had fell into disrepair. This canal allowed ships to pass through the Mediterranean to the Red Sea via the Nile River and was a forbear to the Suez Canal completed in the Nineteenth Century. 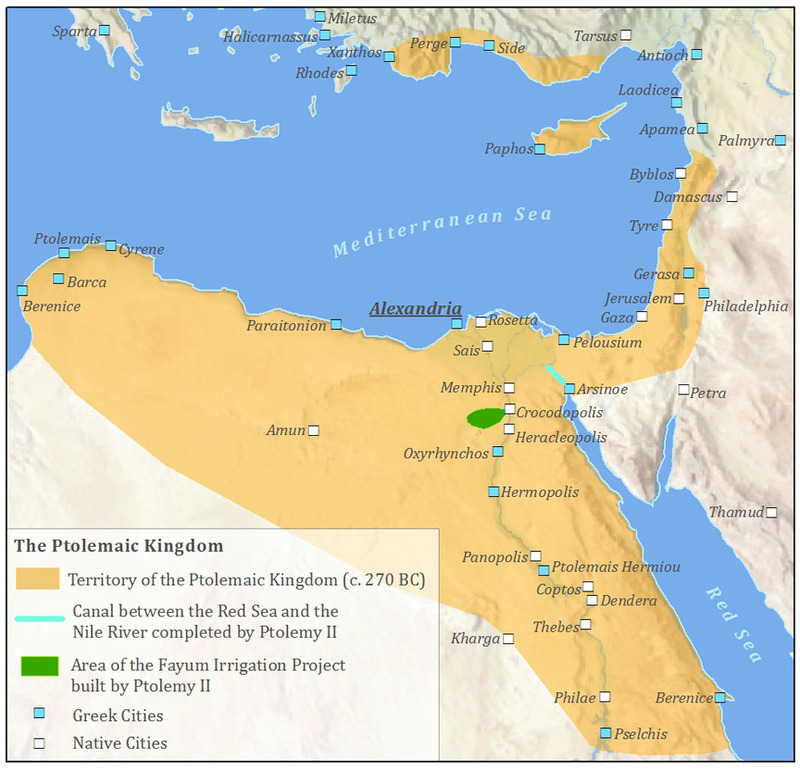 Ptolemy II also sponsored the draining of Lake Moeris in the Fayum Oasis, reclaiming about 1,200 square kilometers of easily irrigated agricultural land, which became known as the 'Garden of Egypt'. With the help of new innovations in agriculture, such as the water wheel, the Fayum blossomed into the most productive area of the country. The Great Lighthouse of Alexandria, one of the 7 wonders of the Ancient World. At the Great Library of Alexandria the Jewish Old Testament was translated into Greek for the first time: the Septuagint. According to Jewish tradition, Ptolemy II called upon 72 Jewish scholars and placed them in separate chambers with the task of writing out the Torah in Greek. The 72 separate accounts were said to have been virtually identical. The translation of the Old Testament into Greek allowed it's stories to be spread throughout the Mediterranean World and may have had a major influence on the rise of Christianity a few centuries later. But Judaism was not the only emerging religion that influenced the culture of the great city of Alexandria. The Buddhist King of India, Ashoka the Great also sent Buddhist missionaries to the court of Ptolemy II and Buddhist graves have been unearthed from Alexandria in this period. It has even been suggested that certain Ptolemaic Greek philosophers may have been influenced by Buddhism at this time and that they in turn influenced the early development of Christianity. On the whole, the early Ptolemaic rulers enjoyed a good relationship with the local population. They built temples to the Egyptian Gods and integrated their own dynasties into the Pharaonic tradition. During the reign of Ptolemy II and III, many Greek veterans and merchants began to settle in Lower Egypt. Greek citizens still enjoyed the benefits of Greek law and Greek education. Within a century, Greek culture had spread through the country and inter-marriage had created an Egyptian and Greek educated elite. Ptolemaic Egypt however, was not without its weaknesses. The ambition of the Ptolemaic rulers was to continue to exert political and military influence in the rest of the Greek World, this meant that they needed to maintain a large navy. However Egypt lacked the timber needed to build navies, so the Ptolemies had to seek control of forested territory in other areas of the Near East such as Cilicia, Phoenicia, and Cyprus. But the other great heirs to Alexander the Great, the Seleucids, also had a claim to these regions, which led to incessant warfare between the two powers, having the long-term affect of weakening both. The Ptolemaic rulers were also extremely incestuous, often marrying their brothers and sisters as to control political power. It is said that Cleopatra had only six different great grandparents (out of a possible sixteen). This inbreeding no doubt contributed to the decline of the family. Later rulers abused their power and extended their authority, especially over Upper Egypt, which had been fairly insulated from Greek influence up until this point. Towards the end of Ptolemaic rule in Egypt, conflicts within the family emerged and public uprisings threatened the peace of the kingdom. By the time the Romans had began to assert their power in the Mediterranean, Ptolemaic Egypt’s end was nigh. The famous story of Anthony and Cleopatra concludes the Ptolemaic story. In 30 BC, the Roman army sacked Alexandria and Cleopatra committed suicide. This was to be the end of Greek rule in Egypt, although many aspects of Greek or Hellenistic culture continued under Roman rule.